Editor's note: When a discontinued congregation vacates its campus because of declining membership, it may seem like a death knell. But some hear a clarion call to keep God's work in the house. This is the fourth in a series of stories about church campuses retooled to continue ministry in the afterlife of a departed congregation. Next week: A former church transformed into a community education and health center will complete the series. South Street Ministry worshipers at a Wednesday night gathering in October participate in an exercise around the Greek word "ekklesia," or assembly of believers. Photos from South Street Ministry Facebook page. But what if the community services come first and form the foundation for the church? South Street Ministry is among pioneers exploring that concept. Located on the renovated campus of the former Trinity UMC, in a community reshaped by an influx of newcomers from diverse backgrounds, South Street has been experimenting with outreach-before-worship since 2011. It started with an after-school program, Mentoring for Academic Progress, or MAP, for children struggling to stay on grade level at school. “We started that with three kids and a prayer,” recalls Rev. Jim Berlau, an ordained elder in the Florida Conference who oversees the nonprofit South Street program. Now 31 kids are enrolled. With one of Central Florida’s largest government-subsidized housing communities nearby, the program has had offshoot benefits that even Berlau didn’t foresee. Parents report being able to work more hours, knowing their kids are in supervised care, which translates into more income for the family. Through neighborhood block parties and organized gatherings, the ministry has become a social hub that has led to networking opportunities as well. 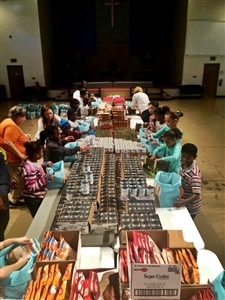 Youngsters in the South Street Ministry MAP program pack food bags to give to those in need at Thanksgiving. South Street’s nonprofit arm has been able to strengthen ties with government agencies in a position to provide grants and other economic assistance to improve lives, Berlau says. The ministry and after-school program share the campus with a pre-existing preschool program and a charter high school that leases space, thus contributing revenue. South Street also draws support from its nurturing church partner, First UMC, Winter Park, and is reaching out to nearby homeowner associations and local businesses as well. Other community programs offered on campus have included fitness classes and job referral services. 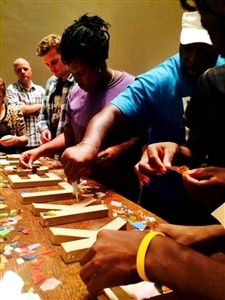 The worshiping community at South Street started with once-a-month services in late 2012. Berlau quickly found that a combination potluck dinner and worship on Wednesday evenings best suited the budding congregants, and now the service has become a weekly mainstay. The gatherings not only help people build relationships with Christ and with one another, they carry their own set of offshoot benefits. Berlau cites the example of a mother who discovered that her adult son, who has a development disorder, had come to a South Street block party and then begun attending the Wednesday worship gathering. The woman has gone on to take a leadership role in preparing for the weekly gatherings and discovered organizational talents in herself that had gone untapped. Recently, outside the ministry, she found herself fielding two attractive job offers. The director will start classes at South Street intended to help people of different socioeconomic backgrounds understand one another better. There’s a big difference between the daily survival skills learned by someone from a working-poor lifestyle and someone who grew up in an upscale environment, Berlau says, adding that smoothing the lines of communication will improve the relationship-building process.